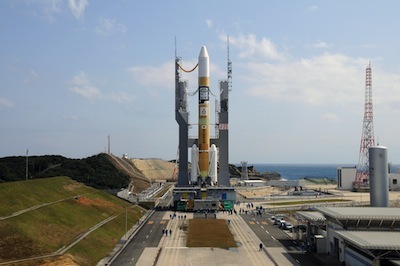 Armed with an initial tranche of government funding for a next-generation rocket, the Japan Aerospace Exploration Agency plans to partner with a private company to lead development of a launcher to replace Japan's H-2A rocket by the early 2020s. Mitsubishi Heavy Industries Ltd., the prime contractor for Japan's current H-2A and H-2B rockets, is almost certain to lead the industrial consortium to develop, manufacture and operate Japan's new H-3 rocket. JAXA invited bids from Japanese industry Feb. 27 for an industrial partner on the H-3 rocket program. Selections are expected by the end of March. "The Committee on the National Space Policy of the Cabinet Office recommended that the private sector be involved to play an important role throughout the new flagship launch vehicle project to make it an internationally competitive launch vehicle," JAXA said in its Feb. 27 announcement. "By including a private company, the committee said that the ability and power of the private sector should be fully leveraged in the development and ... that company shall also be able to provide launch services autonomously." The preliminary schedule calls for the new flagship H-3 rocket to make its first launch in 2020. "The new flagship launch vehicle will be freshly developed with a goal of securing Japan's autonomous launch capability of satellites and other payloads while acquiring international competitiveness in the space transportation field and maintaining and developing technical and industrial bases," JAXA said in a statement posted on its website. Japanese officials say the two-stage H-3 rocket should be less expensive and flexible in launching often with different types of satellites for government and commercial customers. A new hydrogen-fueled LE-X engine is in development for the H-3 rocket's first stage. Two of the engines, each generating about 300,000 pounds of thrust, will power the H-3 rocket's first stage. The LE-X engine features an open expander cycle, in which hydrogen from the engine turbopump is diverted to the main combustion chamber's cooling channels and then used to drive the turbines before being injected into the combustion flow at the nozzle extension, according to a technical document produced by JAXA engineers. Engineers say the open expander cycle, only used on upper stage engines up to now, allows the rocket engine to have a simpler design, reduces pressures and temperatures inside the engine, decreases heat on the turbines of the turbopump, and makes the engine more robust to failures. The tradeoff is the LE-X engine is heavier than its predecessor engine on the H-2A rocket. 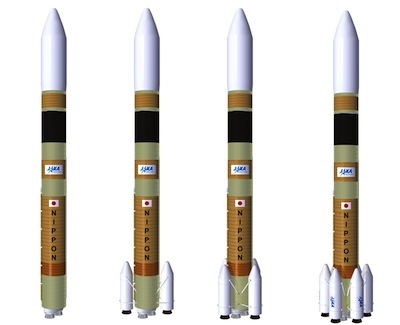 The H-3 rocket could be configured with zero, two, four or six strap-on solid rocket boosters to lift heavier payloads into orbit, according to JAXA's current design concepts. The basic configuration with no solid-fueled boosters could put up to 3 metric tons, or about 6,600 pounds, into a sun-synchronous orbit, a type of orbit often used by Earth imaging satellites. The launcher's most powerful version, with six boosters, could put a 6.5 metric ton payload into geostationary transfer orbit, the drop-off point for communications satellites heading for operating positions 22,300 miles over the equator. The Japanese government's 2014 budget includes about $70 million, or 7 billion yen, to start development of the H-3 rocket and conduct a systems definition review, followed by a basic design phase, according to documents published by Japan's Cabinet Office. The budget still needs approval from Japan's parliament, the Diet. Development of the H-3 rocket is predicted to cost about $1.9 billion, or 190 billion yen, over the next eight years. Once the H-3 rocket is operational, JAXA hopes it will cut the H-2A rocket's $100 million launch cost to between $50 million and $65 million. JAXA says such savings could be achieved by exploiting commonalities in avionics and solid rocket motors with Japan's Epsilon rocket, which debuted last year and is tailored for launches of small satellites. Mitsubishi's H-2A rocket has found little success in luring commercial contracts despite a solid track record with 22 flawless launches in 23 attempts since its debut flight in August 2001. The scaled-up H-2B rocket, featuring a wider first stage with two main engines, has a 100 percent success record on its four flights to launch Japan's HTV cargo freighters to the International Space Station. Officials blame high labor costs and a strong yen for the H-2A's inability to court many international customers. Mitsubishi launched a Korean Earth observation satellite in 2012 under a commercial contract, and the firm announced a deal in September to launch the Canadian Telstar 12 Vantage broadband communications satellite on an H-2A rocket in late 2015. The Telstar contract was signed after the yen's value dropped against the dollar in 2013.